Our lives, as we’ve known them for the past two years, are over.? Done.? Finished.? Caput. No, my family hasn’t been diagnosed with some rare disease (although, if we were, I’m sure it would? probably be hound-dog transmitted).? Nor are we moving to Siberia or Mars, or even the foreclosed house across the street.? In fact, there’s nary a runny nose in the house at the moment (although that changes on an hourly basis around here) and? it’s not like we could sell our house even if we wanted to? (in case you haven’t been watching the news for the last year or so, here’s a tip—nobody’s buying). What’s happening around here is equally huge, though.? Maybe huger (okay, is that actually a word?– because it looks awfully strange).? At least in my mind.? 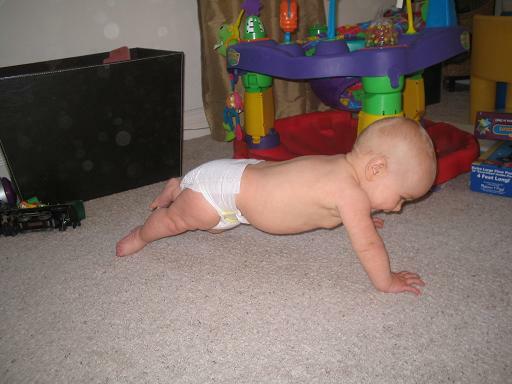 You see, our daughter is trying to crawl.? And she’s getting darn close. Before you break out the champagne and propose a toast, let me educate you—this is not a good thing.? Not even close.? Of course, with the first baby, you think it’s great.? Amazing.? The most spectacular thing ever to happen.? I mean, can you imagine?? 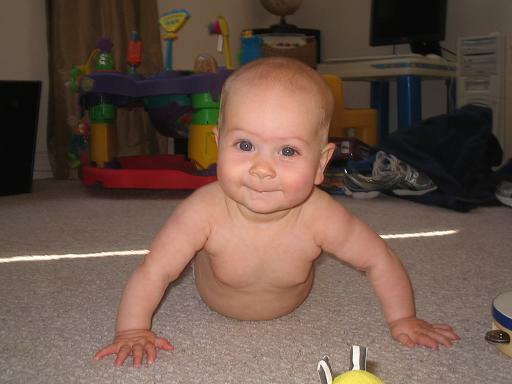 A baby that actually crawls?? It’s got to be some kind of miracle, akin to the parting of the seas.? Or having the entire family sleep in past 8:00 a.m.
And I have nightmares.? Scary, terrifying nightmares.? 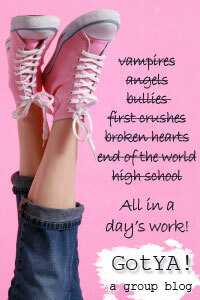 Not about serial killers or massive earthquakes (but thank you, Mr. Newsman, for sharing that tidbit of info with us? about the expected big one in California—perhaps I can oblige you with a horrifyingly bad dream sometime in the near future), or even massive blow-outs on airplanes.? No, I have nightmares about not being able to? locate my daughter, because she’s been buried alive in a? sea of papers or junk somewhere in our home.? In fact, the idea is so frightening that we might actually have to (gasp!) keep our house tidy on a weekly basis.? And I’m not sure it can be done.? My brain just doesn’t work that way.? And hubby?? Well, I don’t even think that part of his brain existed in the first place. 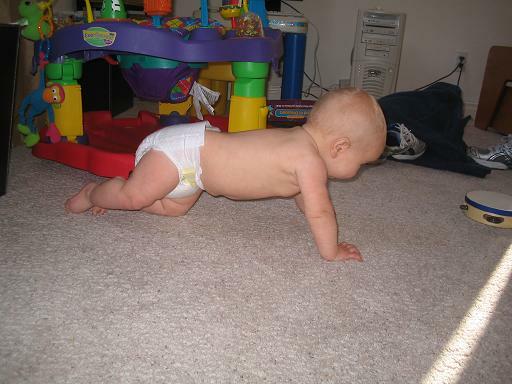 Okay, so I realize she had to start crawling at some point.? It’s just that thus far, I’ve managed to live in blissful denial, suppressing that concept so it only existed as a vague, fuzzy notion in the far, far reaches of my brain.? Sort of like ironing.? And there should be some kind of age limit.? No drinking until you’re twenty-one, no crawling until you’re two.? Hmmm….maybe if I’d actually obeyed the former law, I’d be having better luck with the latter. So, based on the photographic evidence provided below, can anyone tell me how much time they think we have left? Exhibit A:? Okay, so technically it’s not an attempt-to-crawl photo, but it was so darn cute, I had to include it. Exhibit B:? What, has she been watching the Jane Fonda work-out video or something? She looks really close….I’d say a matter of a week or two….how old is she? Debra, she’s so dang cute I cannot stand it!! She is SUCH a cute baby!!!!!!! She’s only 6.5 months. Darn—I was really hoping somebody would say, “Nah, she’s got another five months or so to go.” Thanks anyway for your input! Um, tomorrow she’ll be crawling. Go Finley! I’m with Heidi, she’ll be crawling tomorrow! Nice Plank Position too, wish I could do that. Oh boy! You have your hands full! She is just beautiful; congratulations.